Stayed 5 nights in this lovely property in a delightful part of France. The house has a modern kitchen and bathroom downstairs. Upstairs, the bedrooms have modern hand basins and bidets, otherwise everything else is authentically original which adds to the charm. Across the road is the owner's property complete with a very pleasant swimming pool. An added bonus for us was that the owner, Alain, was staying in his house. He is an absolute charmer and very helpful. The only possible downside is that there is only one toilet and it is downstairs. The nearby village is a couple of miles away and has butcher, baker and tabac , bar/cafe and a small convenience store for essentials. We had a lovely stay at this quiet cottage. Alain was lovely and nothing was too much trouble. The cottage is well equipped and has everything you might need for a stay. Our son who flies drones had a great time with some excellent footage of the surrounding area. We had a very relaxing stay and would not hesitate to return if we were in the area again. Rustig gelegen met 3 ruime slaapkamers. Goed uitgeruste keuken met een fijne tuin met terras. Vriendelijke eigenaar die ook prima Engels sprak. Zeer geïnteresseerd en een top manier van hem geleerd voor het aansteken van de barbecue. Goede tv met redelijke WiFi. Zwembad achter het huis van de eigenaar ook prima. 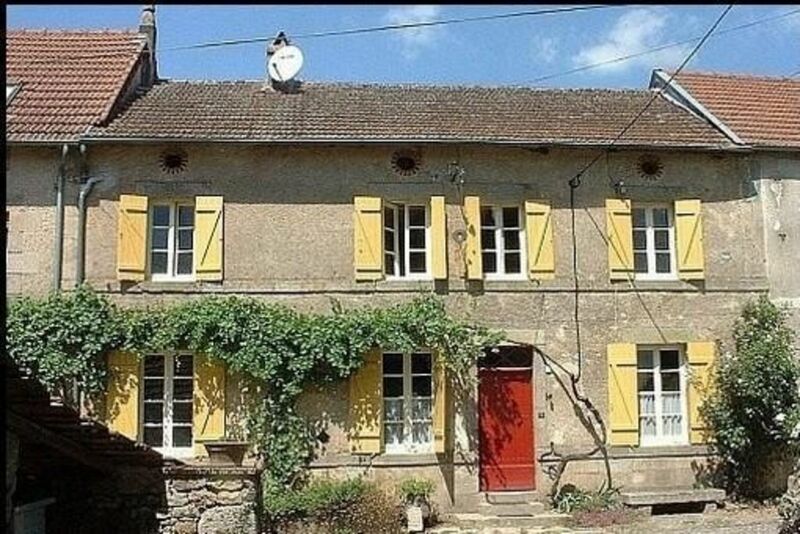 Maison ancienne confortable. Pieces de vie très spacieuses. Équipement électroménager au top. Partie de jardin réservée au gite agréable tonnelle, barbecue, chaises longues on peut juste regretter qu'elle ne soit pas accessible directement de la maison il y a une petite route, très peu passante certes, a traverser. Belle piscine avec une superbe vue partagée avec les propriétaires qui sont très arrageants. Notre hôte nous a donné des conseils utiles et pertinents sur les commerçants du coin nous nous sommes régalés. Séjour donc agréable dans un calme absolu. Merci Thérèse pour votre gentille appréciation. Ma maison, comme de nombreuses fermes des Monts d'Ambazac est située d'un côté de la rue... et le jardin de l'autre. Cette rue des Petits Marmiers, est une impasse qui désert les 8 maisons du hameau et s'arrête à 300m. Les enfants ont l'habitude d'y faire du vélo et elle est, comme vous le dites, très peu passante. En sortant de la maison, il faut la traverser pour être dans le jardin du gite. Ce jardin privatif est à 5 mètres du petit banc en pierres adossé à la maison que l'on voit sur les photos. J'ai décrit cela dans l'annonce : Équipements / A l’extérieur/ jardin, et je vous remercie de me donner l'occasion de le redire à nouveau. Vos vacances étaient réussies, et j'en suis très content. Au plaisir de vous revoir, avec votre mari et le petit Maël. séjour très agréable avec un accueil très sympathique. Maison calme et confortable avec une très bonne literie. Nous avons été très bien accueillis avec des conseils de balades dans les environs. Une adresse à retenir! We spent a super week in Le Petit Marmiers at La Maison d'Auguste. We were are a party of 5, with 3 older teenagers. Alain and Monique were very welcoming and as soon as we arrived they both familiarised us with the property. The house was equipped with everything we needed and we were glad we had opted for the linen package and cleaning. We loved the private garden especially when Alain fitted us with an extra light so that we could play games in the evening. The swimming pool was an added bonus and we used the pool daily. Alain and Monique were keen to share their fresh produce and the lettuce, cucumber and courgettes were used for our yummy BBQ! We also liked the local farm cat 'Mimi' who was so friendly. The French neighbours were also very kind and welcoming and we enjoyed drinking wine and eating lovely deserts with them on the last night. We loved the area where the house was situated. Ambazac was great for shopping and we stocked up at lidl and super u. We enjoy eating out and we did find that this was the most disappointing part of the holiday. The pizzeria in Ambazac 'freddo' was great and we ate there twice. The service and food was great. We also went to the recommended hotel in Ambazac 'Hotel des Voyages'. The food was first class but unfortunately the service was very slow. We waited over an hour and a half for the starter. Unfortunately there were no other restaurants open in the evening. One evening we did try the kebab shop in Ambazac - this was very good. We wanted an activity week and were able to achieve this at this location. We loved walking around Le Petit Marmiers. We enjoyed the activities at St Pardoux Lake, only 20 minutes drive away. We hired bikes and cycled 8 miles. We recommend you stick to the cycle piste. We went another day and walked 8 miles around the lake. Beautiful and a welcome stop half way at a cafe for drinks and ice cream. Our teenagers also enjoyed the adventure trail - PARC ACROBATIQUE EN FORÊT. It was very reasonably priced. We recommend that you visit Oradour-Sur-Glane. This was a chilling experience visiting the village that suffered a massacre by the Nazis in 1944. The whole village remains untouched and is maintained as a permanent memorial and museum. The house really suited our needs. It has everything we needed. Alain and Monique were extremely helpful, kind and the perfect hosts. If you are looking for a quiet relaxing holiday, then this is perfect. Thank. you.